The Royal Philharmonic Orchestra delivered a marvellous rendition of Elgar’s Enigma Variations, a work agnosingly and stereotypically English in equal measure. Their performance was really rather good, so too those who accepted the invitation to submit their thoughts in an email to this evening’s LIVE broadcast from the Royal Albert Hall. 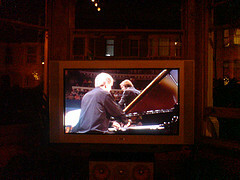 During this evening’s LIVE Prom concert from the Royal Albert Hall *, the gorgeously fluffy and terribly well-informed and sickening-good-at-presenting Suzie Klein invited members of the TV audience to submit their comments on tonight’s performance of Elgar’s Enigma Variations and suggest what Elgar’s “Enigma” might have meant. Self-indulgent, hippocritical and fundamentally naiive as I am, I did submit to her invitation with relatively little resistance. The email is sent. The variations are barely over. So, just for the sake of honesty I figure it might be fun to include what I sent here .. .and then see whether the comment gets read out. In the unlikely event that it actually get’s read out I will, of course, report back later. There’s no doubt that Elgar was a businessman and this is illustrated in no small part by the title assigned to the set of variations which Elgar is immediately associated with. The title of “Enigma Variations” are just that. The idea of a man who must surely have had a good eye for marketing. What better way to keep this nostalgic and stereotypical portrait of the English countryside than by keeping people guessing about what each of its’ consituent parts really means. To sum up all of the work in a nifty, difficult-to-forget title and then associate it with what is instantly recognisable English music is an illustration of someone who could well have wanted to secure his place in history. If there’s a sliver of a possibility that this is what Elgar intended then well done him. Well done too to the members of the RPO who, under the direction of a conductor brought in at the last minute, pulled off a deeply impressive performance of what is the trickiest variation of all, the one we all recognise instantly and pay the closest attention to. * Oh yes, it’s live. The brochure says a 7.30 start and the TV schedules say the BBC Four relay starts at 7.30pm too. This is terribly exciting. It might seem to some like I’ve been a little tardy on reporting my Proms experiences this past week. There is a good reason for it. I’ve experienced a bit of a revelation this week in terms of listening and appreciating. It’s only now I’ve felt suitably inspired to write about a series of Proms events which have made my eyes pop out. Prom 24 saw Benjamin Britten’s Piano Concerto performed at the Royal Albert Hall. It’s a work I really ought to have listened to before now especially given that the composer Benjamin Britten is another personal hero of mine. You’d think too I would have made a point of going to the Albert Hall to see the concert, or if I couldn’t do that, listening to the live radio broadcast. I failed to do either, once again asking me to question just how committed a Proms fan I really am. What I did end up doing was listening on the listen again service via the BBC website. It’s not the best way to listen to a concert but sometimes needs must. I ended up listening to Prom 24 at work. I enjoyed the opener (Sieblius’ Tapiola) and got myself psyched up for Britten’s Piano Concerto. As it turned out, what with the phone ringing and people asking me to do bits of work (I mean, for goodness sake, I’m listening to a Prom .. please leave me alone) I found myself dipping in and out of the concerto, not really giving it the due attention I always feel such an event deserves. As it was, I found myself enjoying the performance a huge amount, so much so that I ended up listening to the concerto itself four or five times whilst I was at work. I was the quietest I have ever been in the office. People all around me seemed a lot happier as a result. The Piano Concerto was a revelation to me. I’m a fan of Britten’s music but I’m aware that quite a lot of people may well think his music is a bit “spikey” on a first listen. This was how I was expecting the Piano Concerto to be. And yet this work, written as a Proms commission in 1938 by Benjamin Britten when he was only 24 was fresh and exciting, fun and accessible. In fact, it was so much fun to listen to and so packed full of memorable melodies I began to wonder why the rest of his output didn’t turn out like that. Excited as I was by my exciting discovery, I made a point of trying to listen to a decent recording of the work. Napster turned up only two recordings, one of which was conducted by Benjamin Britten himself. Both of them failed to excite me in anyway. The last few bars of the last movement (this was the key bit for me) were slow and drawn out. A dull end to what I had heard this week during a live recording as an incredibly exciting piece. It got me thinking that had I heard Britten actually performing the work, or indeed heard the performance of him conducting it, I wonder whether I would have got as excited about it as I have done here. As it turned out, Simon and I made yet another discovery on the TV hard drive last night. There, buried deep in between episodes of Heroes and House and various other things was a BBC Four at the Proms edition as yet unwatched. It turned out to be the very concert I had been thinking about all week. Simon and I watched it. It was totally amazing. Stephen Osborne, the piano soloist, is the person who is fundamentally responsible for breathing new life into this piano concerto, in my opinion and that, strikes me as a very special Proms moment this year. 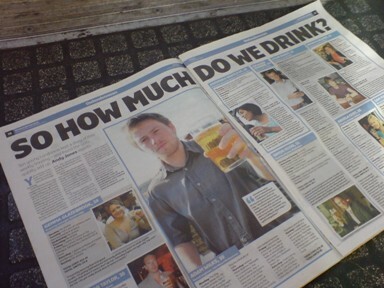 I bristled with excitement as I ripped open tonight’s copy of The London Paper (I always choose that paper over the London Lite – I prefer the font and the layout) and saw a double page spread devoted to London drinkers. It seems that a colletion of Londonites have recorded their drinking habits in the form of a diary and in so doing all of them have failed to meet the Government’s defined weekly alcohol limits. I’m delighted to say that even when I was having a few bottles of beer every single night I didn’t come close to any of their personal totals. As for the specimens who spent between £80 and £100 on alcohol per week, they really need to get down to the supermarket. I saw 8 cans of Fosters for £6. I was tempted, very tempted. I succeeded in resisting the 8 cans of Fosters for £6 in White City Tesco Express this lunchtime as I basked in my smugness at not having touched a drop last week and only two miniscule bottles this week (it was a special, special ocassion). Now I’m home though, I figure that it might be rather to celebrate the passing of this milestone by having a drink. I’m delighted to announce that Simon has selected two smashing looking bottles from nearby Sainsburys which we will, no doubt, tuck into sometime during this evening’s Proms premiere. Although obviously, I will only be sniffing the beverage. Keep it simple, that’s what they say when you’re thinking about what to write. So it is with this particular (rushed) blog posting. There’s strawberry jam to be made this evening (yes really) and some cleaning up and general preparation for a big day tomorrow. I can hardly wait. I am, quite literally, counting down the hours until 6pm when I’ll be home (albeit at work still) but at home. I only have one MP3 on my mobile phone and I’ve been listening to that one track all day long. Sadly, rules and regs prevent me from posting a link to the MP3 itself. To do that, frankly, would be Thoroughly Bad. Nothing to stop me from pointing you to the original soundtrack as featured in the opening credits of one typically British, entirely lewd, corney and brash film from a series entitled “Carry On .. ” This particular is my favourite. The music you’ll hear in the clip featured in Prom 2 performed by BBC Concert Orchestra conducted by the marvellously enthusiastic John Wilson, who I’m delighted to say will be conducting the London Philharmonic Orchestra at the Festival Hall in their 75th anniversary season which starts in September time. Now .. to the kitchen. Oh and by the way .. if I had the choice I’d probably want to play the scurrying violin part although would probably settle for the thunderous timpani solo in the middle of the clip. Oh yes .. that’s an indication of just how many times I’ve listened to this one minute thirty seconds.